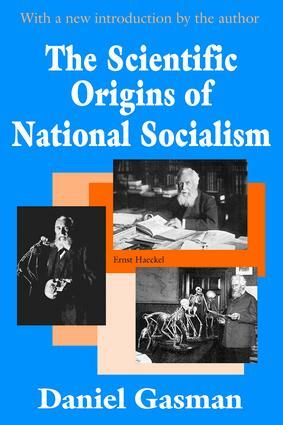 Many studies of the origins of National Socialism claim that the vo;lkisch and proto-Nazi movement arose largely as a reaction to the materialistic ideas of nineteenth-century science and especially to the naturalistic philosophy of Ernst Haeckel and the German Monist League. Using hitherto unexplored material, Daniel Gasman calls this generalization into question. Arguing that the importance of science has been relatively neglected in accounts of the intellectual origins of Nazism, he attempts to show that Haeckel's "scientific" Darwinism, and his movement, the German Monist League, were proto-Nazi in character. Contrary to popular belief, Haeckel's type of social Darwinism actually played a critical role in the formation of National Socialist ideology. In his new introduction, Gasman notes that recent research goes far to confirm Haeckel's role as an ideological progenitor of fascist ideology. This is true not only for Germany, but also for the birth of fascist thought in Italy and France. In general, Gasman claims, the history of science plainly reveals how Haeckel's social Darwinism nourished the roots of fascism no less than avant-garde modernism.